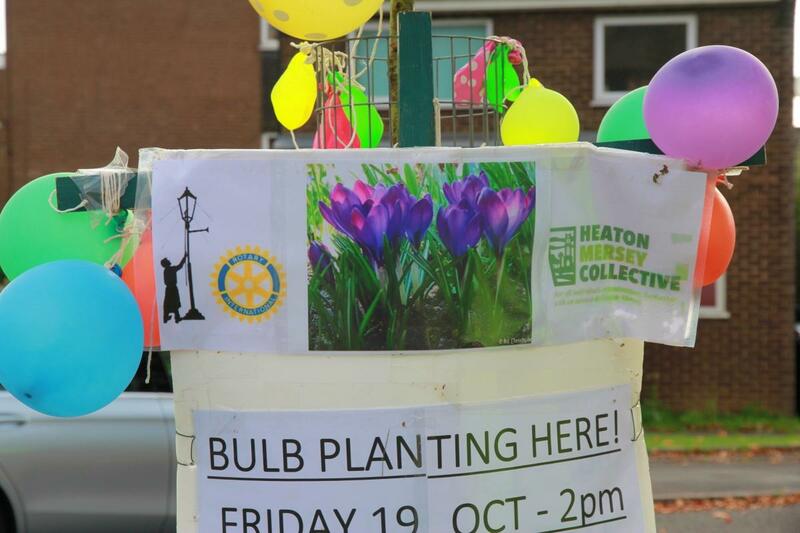 We worked with local school children and the Heaton Mersey Collective to plant crocus corms . The choice of flower is a reminder of Rotary's campaign to eliminate polio , more details below. The planting date was chosen to be close to World Polio Day on 24th October to raise awareness of the global campaign to eradicate polio. Whilst this campaign has been highly successful , the vaccination program must continue to keep the disease at bay . Rotary International has been central to this program with support from the Melinda Gates foundation . In developing countries when a child is vaccinated , it is normal for a dab of purple dye to be put on their finger to check who has been vaccinated and avoid a double dose . The crocus colour is a reminder of this process. Lamplighter worked with the Heaton Mersey Collective , pupils from St Johns School and other groups to plant what is now known locally as "crocus green". We also planted poppy seeds to commemorate the end of WW1. Look out for a purple crocus display in the spring !